Picture yourself enjoying the quiet elegance of Salerno Lake Cottage: Having breakfast in the screen porch cooled by ceiling fans or lounging on the spacious waterside deck. Plunge into the deep, clear waters of Salerno Lake or take the canoe out for a paddle. Hardwood floors and ceilings, picture windows and a stone hearth create an environment of tasteful comfort. Flower beds, a pretty cedar bunkie by the lake and the option of an outdoor shower add to the charm. Come to Sara's Place on Saskatchewan Lake. This very clean, 2 bedroom waterfront cottage, sleeps 4-6 (maximum). 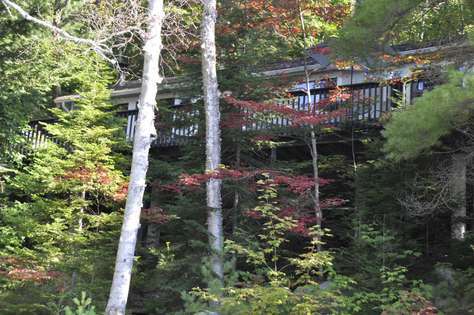 Cottage is only 40 feet from the shoreline, yet privately secluded by trees. Great for swimming, fishing, canoeing and waterskiing. Feeds into 3 larger lakes. Beautiful sandy beach, large spacious deck for relaxing. This location has it all. This is a Sunday to Sunday Rental. BOOK TODAY! 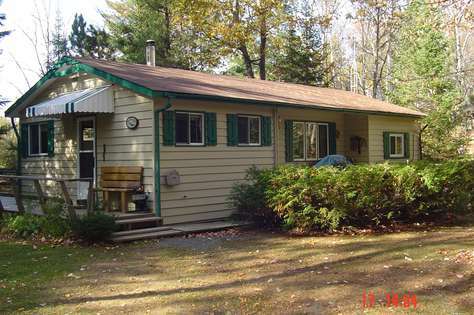 3 Bedroom cottage on Outlet Bay on Drag Lake. Enjoy the quiet time of this great surrounding on a beautiful property. Listen to the loons call with your morning coffee on the deck or down at the water.This property boasts 6.5 acres and 540 ft of private shoreline. The sunken livingroom boasts an amazing view of the lake. Spacious diningroom with a large harvest table for those evening gatherings. Each bedroom has a queen size bed. The two front bedrooms have there own balconies to enjoy a coffee in the morning or a glass of wine in the evening. Newly renovated bathroom with ceramic floors, glass doors and modern fixtures. This property has an abundance of privacy. In the backyard set up a game of lawn darts on this flat area or play a game of horseshoes. At the shoreline, enjoy patio furniture for lounging in the sun. The firepit is set up on it's own point of land and ready for those evening marshmallow roasts. 10 Minutes from Haliburton where you will find restaurants, LCBO, beer store, grocery store and hospital. A true getaway! 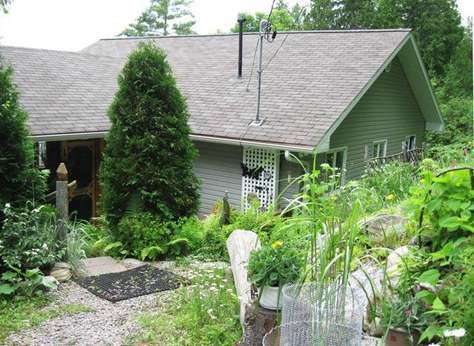 This is a lovely, clean family cottage set on a peaceful, private spring fed lake. With southern exposure and a gorgeous treed lot, this retreat offers tranquility and a perfect get-away. A five minute scenic drive will take you into Dorset to the doorstep of Robinson's General Store (voted best country store in Canada) where you will find everything from worms to champayne. For those adventurous, you can climb the lookout tower in Dorset or venture to Algonquin Park - which is approximately 25 minutes away - to indulge in hiking, swimming, kayaking, canoeing, mountain biking, fishing and star gazing. As a bonus, you will find Killarey Lodge (great food) in the Park. Ten minutes from the cottage is the small town of Dwight, home of Henrietta's Bakery (best sticky buns ever), and Dwight Beach, a beautiful sandy beach and boat launch on Lake of Bays. There is shopping and dining in Dorset and lots more to be found in nearby Huntsville, Bracebridge, Port Carling, Haliburton and Minden. Golfing opportunities can be found at Pinestone Inn, Grandview and Deerhurst Resorts just to name a few. New Royal home, approx 3,000 square feet. 200' Frontage overlooking bay. Large grass area, large front deck 550 square feet plus a 100 square foot rear deck. Morning sun and sunset. Great view for sunrises, swimming and fishing. Partial shallow entry, near the Ganaraska hiking trail. 2 Kitchens, 2 Livingrooms, 2 Diningrooms, 2 Tubs/showers, 2 TV's one on satellite. Approximately 1,500 square foot cottage. Lake frontage facing east overlooking bay. Large grass area, sand beach, fishing from property, new dock, swim raft, front deck. Upstairs has cedar walls and ceiling. Morning sun and great views for sunrises, swimming and fishing. Partial shallow entry, near the Ganaraska hiking trail. 5 bedrooms, 2 kitchens, 2 bathrooms, satellite TV. Property is located at end of road. 14' aluminum boat available. 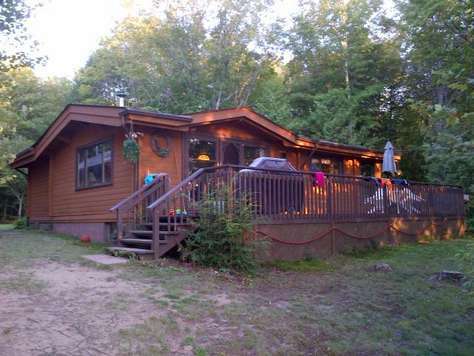 Cottage is $1650.00 per week based on 5 people, additional people $150 per week. Canoe, kayak and rowboat can also be rented for $100.00 each for the week. 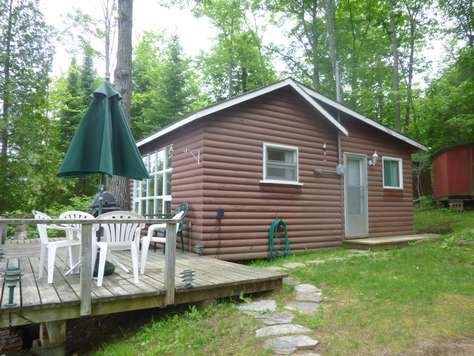 Log cottage located in quiet bay on clean Kawagama Lake (5th largest lake in region), with long views from dock. Nicely decorated thoughout, with cathedral ceilings, huge deck across entire front of cottage, great for outdoor dining. 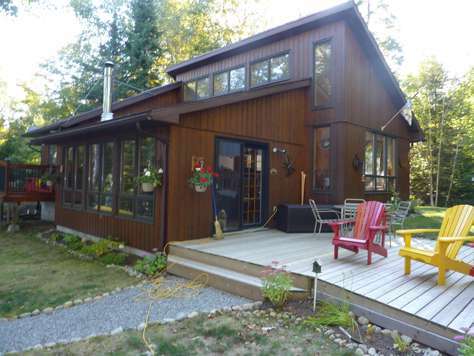 Cottage located off of private road, on a large treed and completely level lot with beach waterfront. Ideal for kids of all ages. 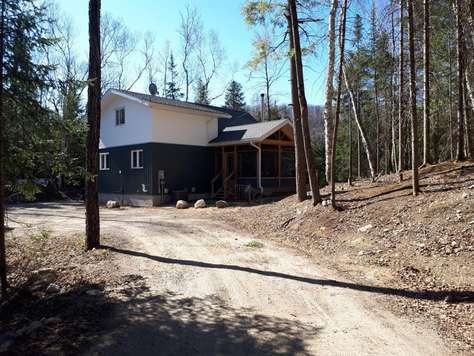 Close to marina, hiking trails, fishing and town events, all located within a 15 minute drive or 45 minute drive to Huntsville or Algonquin Park. Located 2 hours from Toronto. 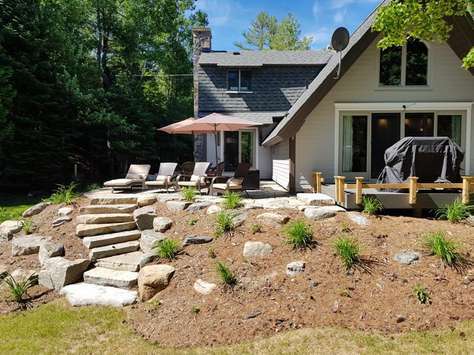 On the shores of Spruce Lake in Haliburton sits a brand new 3 bedroom chalet that has amazing views. This chalet has just recently been completed and now is awaiting its guests.The chalet faces southwest for spectacular sunsets from the deck. Take the canoe out on this quiet lake which opens into Drag Lake and Outlet Bay. Lots to explore with good fishing. Only 15 minutes into Haliburton where you can enjoy great restraunts, quiant shops along the main street. Rustic single level extremely well maintained cottage with lots of natural wood, including furniture. Very bright with lots of windows on well treed, semi secluded lot, overlooking a river, Small private cedar dock on a quiet winding river suitable for swimming, fishing and canoeing. Unlike a lakefront property, rivers offer less noise, (motorboats, parties, etc). Less wind, more privacy and nature. 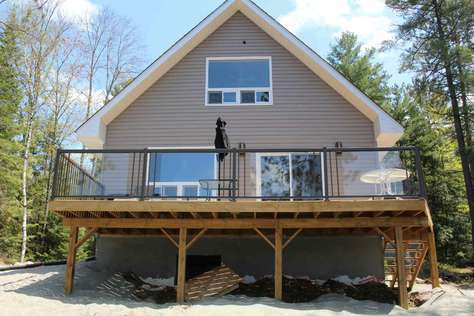 Cottage has a wraparound deck, Free high speed internet (Wifi). On the shores of Outlet Bay on Drag Lake you will be invited to a brand new 1800 square foot cottage nestled among the trees on 1 acre of property. Southern exposure with 200 feet of frontage. 3 Bedrooms, 2 bathrooms, cottage has a full basement great for entertaining and playing games etc. Enjoy the deck at the waters edge. Just 10 minutes to Haliburton where there are golf courses, shops, Haliburton School of the Arts at Fleming College, very active arts and artisan community. Enjoy the farmers market, and many summer and fall events. BRAND NEW TO OUR INVENTORY!! Every once in awhile we stumble upon a picture perfect cottage. This cottage sits on a point & there is a view at every angle. Tamarack Lake is a peaceful & quiet motorless lake where you can really embrace nature. Shoreline has a sandy beach area for swimming. This cottage boasts 3 bedrooms & is newly renovated with all modern utilities.